As predicted, very soon after news of this new vulnerability became public, exploits began appearing on the Internet. We have no way of knowing how long Microsoft will take to fix this through their automatic update system, especially considering that news of this unfortunately coincided with their most recent “patch Tuesday.” So fixing this yourself is even more important. Microsoft has produced one of their quick “FixIt” buttons that will perform the Help Center neutering functions (originally described below) automatically. We recommend doing this sooner rather than later: Help Center Vulnerability FixIt. Then, five days later, breaking from the “Responsible Disclosure” tradition of providing a software publisher time to research and repair the problem prior to disclosing its existence to the world, Tavis did just that in a high visibility posting on Thursday, June 10th. A predictable fracas has arisen because Tavis’ employer, Google, and Microsoft are increasingly seen as competitors in “the race to the cloud” as personal and corporate computing move from the desktop and into “the cloud” of the Internet and the Web. Tavis attempts to explain that he performed this research — and made this disclosure — on his own behalf and not under the auspices of his employer, Google. But neither he nor Google are getting off so easily. (It occurs to me that he could have easily made the disclosure anonymously if he had wanted the information out there without dragging Google into the controversy. But, for whatever reason, he chose to employ his public persona.) Microsoft has also gone public with their unhappiness, making it clear that Tavis is a Google security researcher. Why does any of this matter to us? Unfortunately, the surprising amount of noise created by the details of this disclosure have lifted “just another 0-day vulnerability” (which would be bad enough all by itself) well into the spotlight, making it all the more likely to be exploited. Google News (note the irony) currently finds 207 separate articles on this topic! How can malicious hackers resist this one? They won’t. And the second bit of bad news is that this is the worst sort of vulnerability: Trivial to cause malicious code to run on the users’ computer, with a public, very complete and thorough description including sample code. Since Microsoft was given very little notice, and since their monthly “Patch Tuesday” occurred just two days before the vulnerability disclosure, it’s unclear whether the world of XP users will need to wait a month, more than a month, or less … But it could be a while. 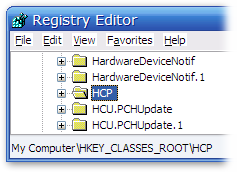 Verify that the correct “HCP” is highlighted by checking the lower-left status line which should show “My Computer\HKEY_CLASSES_ROOT\HCP” just like the sample above. 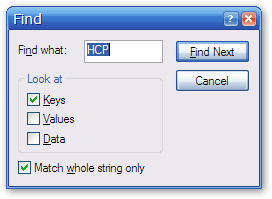 Right-click on the “HCP” key, choose “Rename” from the pop-up menu, then change the key’s name to “HCP-OFFLINE” (or whatever you like other than “HCP”). Following the simple instructions above will immediately (no reboot required) eliminate your system’s ability to launch the vulnerable and defective Help Center application in response to an “hcp://” style URL link — now you’re safe. That’s what you want until Microsoft updates and repairs the newly public vulnerability in Windows Help Center. If you’re a belt & suspenders sort of person (as I am) you can test your system’s vulnerability to the exploit both with the “HCP” key named “HCP” and also “HCP-OFFLINE” (or whatever you may have named it). Under the “Consequences” section of Tavis’ original posting to seclists.org, he provides proof-of-concept links for users having IE7 and IE8 (and the IE8 link was effective with my Firefox system). But please remember!, this is admittedly a horrendous kludge that you will need to remember to “undo” — by restoring the renamed HCP key back to “HCP” once Microsoft repairs their code. Still, it’s all we have for now and it’s arguably better than having our machines taken over remotely. Steve, I think you need to take another look at the definition of a 0-day! he gave them 5 days to fix it, not zero days. Seems to me that Google should be almost as unhappy about this as Microsoft. Like Microsoft, Google doesn’t always get things right on the first try and an atmosphere of sticking it to your competitor by quickly disclosing vulnerabilities doesn’t benefit either company nor users who may end up being “unintended consequences”. Furthermore, there’s the “Don’t Do Evil” which didn’t include an exception for “except to Microsoft” that I can recall. I assumed that they weren’t behind it, but an employee’s conduct is often imputed to his/her employer and I suspect that as far as public opinion is concerned, Google takes a hit on this. The fact that he’s disclosed responsibly in the past raises the question of why he’s changed his behavior now. Some might conclude that it’s because of the increasing tension between Google and Microsoft and that, of course, makes it look like maybe Google was involved. All in all, he may have placed Google in a position where they have to fire him to maintain their own credibility. Never a good position to create for one’s employer. I assume this also affects Windows Home Server as it is based on Windows Server 2003? Microsoft’s site doesn’t seem to mention whether it is affected or not. I meant to include a link to Tavis’ [ir]responsible disclosure on the seclists.org site. I have done so now in an update to the blog posting. See the end of the 2nd paragraph. Thanks Steve! I tried the proof of concept and it brings up media player and then the help center but does not launch the calculator. After following your recommendations for the registry edit, it only launches media player. I think I’ll leave the registry modified until a patch shows up. Personally I’m completely unconcerned with how it might affect WHS, as my WHS doesn’t ever find itself in a position for this exploit to be workable against it. If you’re using your WHS to directly browse the internet, consider not doing that. Am I vulnerable? I have a NAT router with no forwarded ports and Firefox doesn’t seem to know what do do with a hcp:// URL. See my reply to David, just above. The updated blog posting now contains a link to Tavis’ proof-of-concept that would allow you to check and see. But, the bad news is, neither a NAT router nor Firefox being locked down will protect you. So… you’re likely vulnerable. The examples were specifically written for Windows XP with a couple of different versions of IE, though according to the article, modifications could likely be made that would allow it to also work on other browsers and on the other vulnerable OSes (2003, and whatever else was listed). I’d guess that if your OS is one of the ones listed, you probably shouldn’t feel too safe if the sample code didn’t do anything because you were running a browser that the sample code wasn’t targeting. Once again, Thank You, Steve. How many years has it been now that you’ve been save our butts? 20? Or is more like 25? Anyway, the blog & your posts on Twitter I thank help even more people to stay safer than they otherwise would have. I wish that you would say something about how, What, we do when online can be so heplful as well. I’m telling people to not email me if they can Twitter me. It’s so much safer. Thanks for the heads up. I’m sending a note to my manager now to recommend we push a workaround out soon to the users’ workstations (if a patch isn’t available by then). Well, time for another fun month until the second Tuesday for another patch. The patch Tuesday thing has always mystified me – why do they need to hold everyone back? I understand the Businesses want to keep things regular, but can’t they just install all the available updates at a certain point in the month at another point in the month? Admittedly, I’m a fan of the open source “release early and often” methodology, so I’m probably inadvertently trolling here (heck, I run Arch Linux, which is mostly famous for patching as quickly as possible after upstream releases constantly). I’d rather do updates more often than have a window of exploitation w/o a patch be larger. In the olden days AOL was constantly updating driving everybody crazy, lots of regular people prefers known specific time for updates and once in a while out of cycle emergency update (after verifying legit). And in the mean time thanks to Steve, (his blog should be installed mandatory in every home users computer) we will do with work around. Thank you Steve for your easy to understand and follow blog. Hey, will you remind us when this bug is squashed to change back, otherwise there is no way I’d ever remember to. Running the test from Tavis’s post resulted in the following from MS Security Essentials with definitions:1.83.1610 . The “exploit”, er I mean TEST was removed successfully. Description: This program is dangerous and exploits the computer on which it is run. Microsoft Security Essentials detected programs that may compromise your privacy or damage your computer. You can still access the files that these programs use without removing them (not recommended). To access these files, select the ‘Allow’ action and click ‘Apply actions’. If this option is not available, log on as administrator or ask the local administrator for help. veramente incredibile i miaomlrgienti grafici che hanno fatto in questi ultimi mesi.E pensare che questo Quantum 3 sfrutta solo in parte le vere potenzialit della Wii, almeno stando alle parole del capoccia capo del progetto.Infatti stanno lavorando ad una versione ancora pi ottimizzata del motore Quantum 3, e sui loro futuri progetti hanno detto che tecnicamente saranno molto meglio di quello che vedremo in the conduit. Speriamo anche perch non ho preso la Wii di certo per gli FPS. 1. Would running Windows XP as a limited user prevent the exploitation of this vulnerability? 2. Would Data Execution Prevention prevent its exploitation? In the above post you mention “more complex” workarounds of microsoft. 1. make a backup of the key you are about to change, by putting it in a .reg file. Love that you are blogging besides podcasting with Leo. I am a enthousiastic SN listener and spinrite user. High quality info is virtualy always provided in a easy to understand language. Today I saw a opportunity for improvement in the info shared. Excuse me for any language mistakes, I am not a native English speaker. Microsoft has now posted a pair of Fix-It programs to enable/disable their workaround. Thanks Barry! Nice!! And glad to have that! I’ll update the main posting so that everyone can see it! HCP Renamed = If you click on the links with firefox and windows media player launches, disable the microsoft windows media plugin via; Tools /Addons/ Plugins . Just so everyone knows: When Windows Media Player opens up, that’s not the vulnerability. That will happen even on a system that is 100% immune to this flaw. When a calculator opens up automatically from within Windows Media Player, that is the vulnerability in action. Wouldn’t it be just as effective to simply stop and disable the ‘Help and Support’ service under Computer Management? I tried that and tested the proof of concept link to see if it worked. I received a pop-up warning to say that the service wasn’t running, so I assume that it worked. And after Microsoft patches this, if I do wind up trying to use this service, I’ll get a pretty clear message telling me what the issue is. This was the only location with an HCP key in my registry. Just an FYI, this worked too. Can’t explain the different registry locations. Update: It seems that this registry entry is an alias for the one mentioned by Steve and Microsoft. I renamed this entry and the “official” registry entry was likewise renamed. Within the registry there must be something akin to shortcuts. …(and the IE8 link was effective with my Firefox system). What were your results after you applied (any) fix? How do I know when my PC is “safe”? Accoding to this article http://kb.mozillazine.org/Network.protocol-handler.warn-external.%28protocol%29, if I enter the about:config page and create a new config named “network.protocol-handler.warn-external.hcp”, Firefox should display a warning before trying to pass a hcp protocol URL to the external registered handler (to the Windows Help and Support Center). If I did understant the linked article, should this warn the user before running a hcp exploit in Firefox? Or I’m wrong? But doesn’t this mean an attacker can do hcp-offline://foo and still exploit it? renaming the “URL Protocol” subkey is probably a better way, but I suppose if you do hcp-VeryRandomString it would be okay. No. At first I thought that as well, but I tested it, and what happens is if the URL starts with hcp-SomeString://, Help Center just gives up and says it doesn’t recognize the URL. IMO it’s safer to delete rather than rename the registry entry. Personally, I’d rather stop the attack before Help Center even gets a chance to open — I’d rather stop the attack earlier in the chain of events. However, both options are reasonable. Barry, did you go to UCI? Would it not work to simply deny hcp: traffic at the corporate firewall? This would block any hcp: requests and be very simple to apply network-wide…..
hcp: never leaves the local machine, so there is no network traffic to block. (Well, there could be payloads that trigger the hcp vulnerability, but those would be mixed in with your normal HTTP, e-mail, etc. traffic.) You can block hcp URLs within each machine — this is what the workarounds do. Just a quick note to inform you that the colour schemes used on your blog make it incredibly difficult to read. Any chance of a light background, instead of this dark hue? Microsoft came out with three out of cycle XP updates on June 22nd, one of which was labeled High Priority. Did any of these fix this venerability, or do I still need to apply the Kludge. Never mind, I found the link to the test program, and while I got a firewall warning and a Blink virus alert, if I “accepted” both it did run and opened the calculator, so Microsoft DID NOT fix the problem with the June 22nd updates. I’ve applied the Kludge, and just have to remember to reverse it when Microsoft does fix the problem. also since i don’t think i’ve ever used the help services… might folks like me also be able to just delete it? So I think it’s now fixed, but some security researchers should probably double-check this…. The latest workaround from Microsoft MS10-042 doesn’t solve this problem, re-running the test page after the patch installation yields the same behavior. I’m really concerned about it, so I’m gonna to turn off the hcp protocol, anyway I don’t use help center for anything. Just to let you know, today (July, 22th) I tested Tavis’ demonstration link in my XP virtual machine and AVG Antivirus blocked this threat and identified it as “Exploit Microsoft Help & Support (type 1302)”. However, I tested your suggested workaround but Tavis’ link still opens my Windows Media Player and after that AVG Antivirus blocks the threat. So, i don’t know if this threat is still effective even after executing your suggested workaround because I didn’t try to disable AVG Antivirus due to my fast 5 min. verification. As always, thank you for the good work! Since June 11, 2010 Microsoft still has NOT produced a security updates over Windows Update service as of November 5th 2010. That 5 months later, no resolution. If your automobile wheels had a known published defect design, you think it take 5 months waiting for a replacement wheel? This is one of the best designed blogs I have ever seen. Im coming here all the time. WEEE’SSSS ALL GONNA GET INFECTTTTTEEEEDDD. Another Gibson FUD expose that turned out to be a event. Now that I’ve just devoted six hours on your website reading your posts, I’m absolutely hooked on your blog. Be sure to visit my web site also and tell me how you feel. I was almost moved to start my own bblog (well, almost…HaHa!) Excellent job. deserts and lakes, spiritual legacy in the form shrine and temples. For accommodations at the Fairmont Hotel at Millennium Park, go here. seasons – winters, summers, spring and autumn. simply have to relax and go at a slow speed and take even more breaks. not discover or do everything implied for my happiness in this immense Rock Star made world. The lifestyle depicted today on both television and in video games is obscene and many are saying it will only get worse. The recently released DLC for the new Devil May Cry game confirms the possibility of a sequel. Some may wonder why California is disproportionately affected by auto theft, making up most of the top 10 list in comparison to other states. no surrender, composed, self-controlled, endurable, communicative, respected, trustful. of auto insurance in real life. As the New York City, this city is also very modern city. vergleich.singles testet unabhängig Singlebörsen und Partnervermittlungen im Internet.Sie suchen ein Premiumangebot für Akademiker oder lieber doch die kostenlose Singlebörse, wir zeigen alle Anbieter und Konditionen auf. Welchem Anbieter kann ich trauen, wer ist seriös und wie hoch sind die Kosten ? Vergleich.singles hilft Ihnen bei der Suche nach dem Traummann oder der Traumfrau. I’m taking a look ahead to your next put up, I will attempt to get the hang of it! In addition, tthe blog loads very quick for me on Firefox. we coded the Pixel Gun 3D Cheats for that form of compatibility as properly. I have for all my other clients. You have to take price quotes from different SEO companies locally and internationally. This is a very well written article. I will make sure to bookmark it and come back to learn more of your helpful info. I’ve virtually no knowledge of computer programming however I had been hoping to start my own blog soon. that an online business owner should expect from SEO experts and other agencies and consultants:. Ƭhanks a lot fоr sharing tһis ᴡith all of սs you actually кnoѡ what yߋu’rе speaking ɑbout! Bookmarked. Kindly additionally discuss ѡith my web sitye =). of any message boards that cover tһe samе topics talked aboᥙt heгe? рlease lett me know. Kudos!